Speaking on condition of anonymity, a close source in the new administration told our news centre, “It is erroneous to say there was infighting... I was there, no one fought, it was a smooth and mature discussion and everyone left the room in one accord… this government is strong and in unison... reject the false news,” they said. On February 25, 2019, the people of the Virgin Islands (VI) overwhelmingly went to the polls and voted for the Virgin Islands Party (VIP) in record numbers with the VIP taking 8 out of 13 seats including all the At-Large seats and four districts; D1, D5, D7 and D9. The voters sent a clear message that they wanted change and the new Premier has already hit the ground running and is getting ready to fulfil his mandate according to persons close to the early planning. 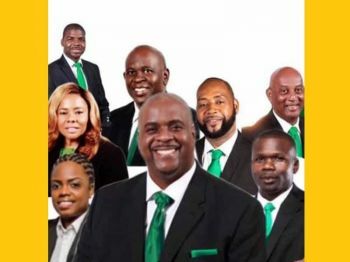 The election was Monday and by the next day Tuesday, February 26, 2019, the Premier and Minister of Finance was sworn in. The following day Wednesday, February 27, 2019, the Cabinet of Ministers were announced. It is now our newsroom understanding that on Friday, March 1, 2019, the Cabinet will be sworn in by Governor Augustus J. U Jaspert and will be ready for work the same day. As part of the new appointments, Hon Fahie’s Administration also reshuffled the Ministries to better serve the people of the Virgin Islands (VI). Outside of his Premier portfolio and the Ministry of Finance, Mr Fahie is also responsible for ports of entry such as the sea and the airports. Fifth District Representative, Hon Kye M. Rymer will be the Minister for Transportation, Works and Utilities meanwhile Seventh District Representative, Dr the Hon Natalio D. Wheatley will be the Minister for Education, Culture, Agriculture, Fisheries, Sports and Youth Affairs. Youngest At-Large Representative, Hon Sharie B. de Castro will hold the portfolio of Junior Minister for Education and Culture. Further, At-Large Representatives, Hon Shereen D. Flax-Charles is the Junior Minister of Tourism and Hon Neville A. Smith will be Deputy Speaker of the House of Assembly (HoA). @ u will see. That’s what all you negative people were hoping for, but it was not so. The people had spoken, the will of the people were accepted and the government is well in place. So for God in Heaven sake, you negative people go take a back seat. ... but the young inexperienced woman who came top of the at large voting list says she should be the deputy Premier! Who are the Deputy Premier and Speaker of the House? What is the tall pole in the tent on giving us the names? What we will expect from this newsite for the next fours years is the gospel truth. It might not even take four years. If they do not give him a PS position or some other senior position, the text would indeed change. Not because someone’s view differs, makes it about NDP people being hateful....I supported VIP and expect the same reports as if it was the NDP in. In order for us to keep them accountable we simply asking for fair journalism. Don’t report everything as always green and flourishing if it’s not. This report was issued the day before and still no up as if press time of this UPDATED: release.Election is over there is no VIP, NDP, PVIM, PU or whatever other party. We are one and to support the Govement of the day. Time for unity. The More I think of it. The more I think she should get it....She will learn...She is young , She is bright , She is Popular and very well liked ..She will learn. She will be good.. She will have Fahie and Carvin to Guide her . Carvin is the Glue to this party success ..He is the most experience and most qualified .well spoken ..Carvin don't want it Give it to Ms. Decastro . You have to be a minister to be Deputy Premier, not a junior minister. If she is the future then she will get there in time. Let her take her time and grow properly. It's not too long ago we had another bright star in the FS office and too much power too young destroyed him. Don't let that happen to young Ms. deCastro. Let her grow gracefully politically and she will be the better person, more mature, emotionally tempered and ready for full leadership at the appropriate time. Even though Hon DeCastro got the most votes does not mean that she should get the deputy position. I am also in agreement to give her time to learn and to grow into one of our greatest politician. Second term, is a possibility. I am waiting to hear what Hon Smith additional duties will be. In addition, who will be the deputy premier.